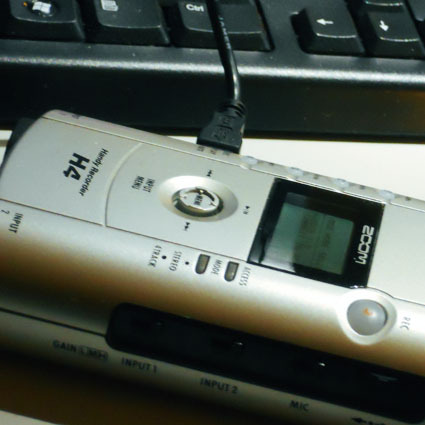 In addition to Dragon I'm using a Zoom H4 digital audio recorder, which is something that my company has used for video production and other projects. It was my hope that it would work well for dictating into Dragon. The first thing that I dictated for transcription was a draft email and it seemed to be fine, other than my stumbling with my words. In that case I was just sitting at a table quietly and that is a different scenario compared to running water and scrubbing dishes. It will be interesting to see how well Dragon handles this audio compared to the other one. In addition to the Zoom, even though it has built-in microphones, I am using two lapel microphones from Radio Shack. I'm wearing a hoodie and the two microphones are attached to the cords for the hood and feeding into the left and right channels on the recorder. I thought this would give me cleaner audio than trying to use the built-in mics, and I've also been having some problems with the recorder and its built-in mics anyway, so hopefully this will bypass those problems. Other than the hardware and the Dragon software, I also use Adobe Audition to clean up the audio. The recorder, for some reason, records at a very low level and I don't think the levels are high enough for Dragon to be able to use it. By opening the audio file in Audition I can raise the levels and also do a noise reduction pass on it and hopefully increase the accuracy of Dragon. At least that is the intent, I have not actually tried a raw file directly from the recorder in Dragon because it just seems like it would be a waste of time considering how low the recording level is. If I thought it would potentially work I would go ahead and try it just to see whether I could save time that way. Instead I just assumed that I would need to process each audio file before importing it for transcription, and that is how I trained Dragon. It might sound time-consuming to do that, but actually it's only a couple steps and it is easy to do. Considering that I do not know whether this is going to be a useful recording and maybe I'm just wasting a little electricity on the recorder while I wash dishes, I'm going to go ahead and wrap up this blog post. It will be interesting to see what my word count is, and to see if that gives me any idea how effective it can be doing things other than dictating directly in to my computer. Ideally at some point I would like to be able to record audio for transcription while I am riding a bike or gardening or doing other quiet activities such as taking a walk. Time will tell if that actually works. I welcome your comments below as always. Followup note: I did need to clean things up a lot before posting this, but not as much as I thought, and the vast majority of the problems were from me fumbling for words rather than recognition issues in Dragon. Also, as a bonus, I accidentally used the raw audio file from the recorder for transcription rather than the processed file, and it worked so well that I just used that for this blog post.